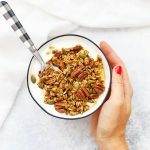 Maple Pumpkin Pecan Granola (Gluten Free & Vegan) – This easy pumpkin granola is the perfect fall breakfast. Homemade granola at its finest! I have a breakfast problem. 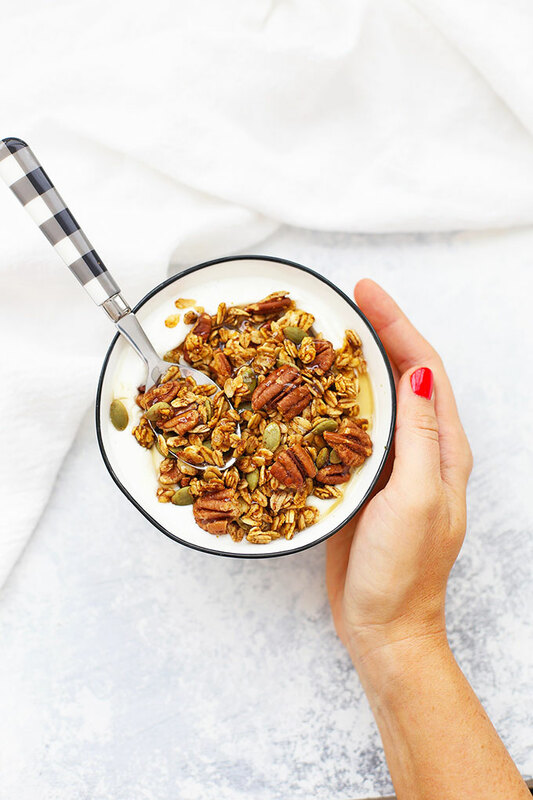 So, while you may be wondering when I’m ever going to get over granola, the answer is never and also you should try this maple pumpkin granola. You’ll love it, and it will love you back. If you’re thinking “um, pumpkin granola?,” just hang on a sec. A different kind of pumpkin recipe. This is one of those recipes that yes, contains, pumpkin, but doesn’t hit you in the face with spices. The pumpkin, maple, and pecans are the real stars of this granola show, with just the right notes from vanilla and cinnamon. Pumpkin magic. 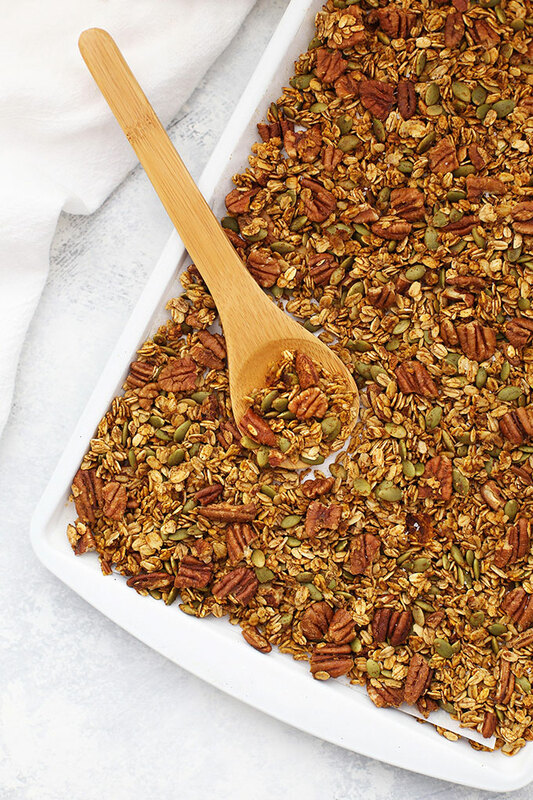 This pumpkin granola recipe uses a double dose of pumpkin goodness! Pumpkin puree lends something amazing to the texture (think those amazing clusters! ), along with a shot of vitamins. Then, the second dose of pumpkin comes in the form of pumpkin seeds. The pumpkin seeds + the toasted pecans add just the right amount of tasty crunch. It’s good All The Ways. 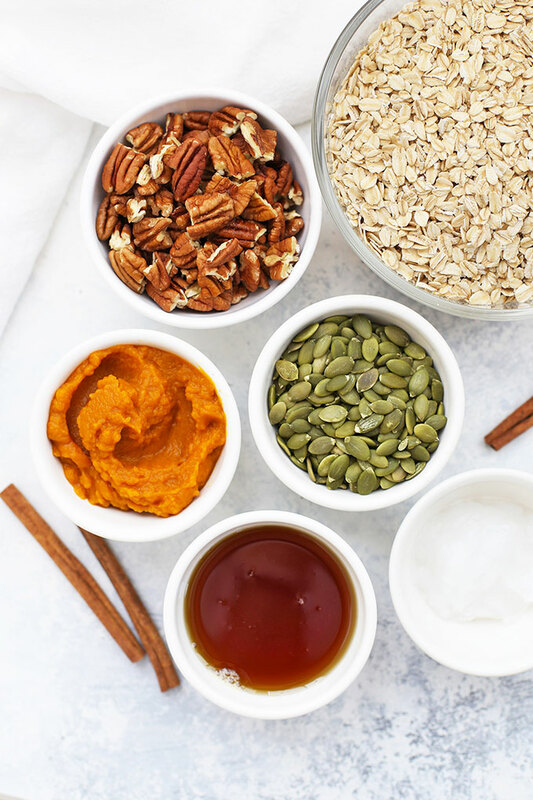 I love that this pumpkin pecan granola can stand on its own (it’s a great snack by the handful or mixed into a trail mix), but it’s also fantastic sprinkled over a smoothie (like this chai spice smoothie), or scooped onto vanilla yogurt or chia pudding. Serving Suggestions – As I mentioned above, this is great in so many ways. Enjoy a handful for a snack, mix it into a trail mix, or sprinkle it over smoothies, chia pudding, or yogurt. It’s delicious and adds such a great crunch! Watch the Pecans. Ovens vary in temperature, and if you aren’t monitoring your oven temp with an oven thermometer, there’s a chance your oven will cook differently than mine. 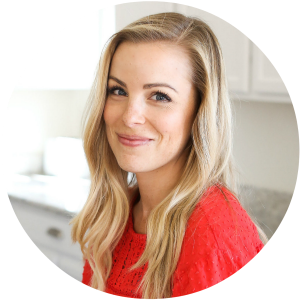 (I’ve used ovens that are 25-50 degrees above or below the temperature they’re set for, which can make a BIG difference in cooking.) If you get nervous about the pecans burning, you can add the pecans during the last 15 minutes of baking time. I’ve never had a problem with burning pecans, but be sure to keep an eye on them in case. Gluten Free Notes – Oats don’t contain wheat gluten, but because of farming and processing practices, they’re often cross contaminated with gluten. If you’re sensitive to gluten, be sure to buy certified gluten free oats. We like Bob’s Red Mill brand, Trader Joe’s brand, etc. A Slick Trick for Nonstick. When making granola, I prefer to line my baking sheet with parchment paper or a nonstick silicone baking mat. (The baking mats are reusable and great for cookies, bars, and sheet cakes, too!) This will keep your granola from burning or sticking, and will help you as you stir the granola to promote even browning. How to Store Your Granola. One VERY important thing with homemade granola is that it needs to be COMPLETELY cool before you store it. If it’s not, it’ll trap moisture (ew, I know) and will turn soggy. If you let it completely cool, you’ll be able to assess if it’s truly cooked through and dry. If you find it’s not, you can pop it back in a 325 degree oven for about 5 minutes at a time until it’s done. When it’s all cooled and dry, transfer it to an airtight container, jar, or bag and store in a cool, dry place (like the pantry). It’ll keep for 1-2 weeks. 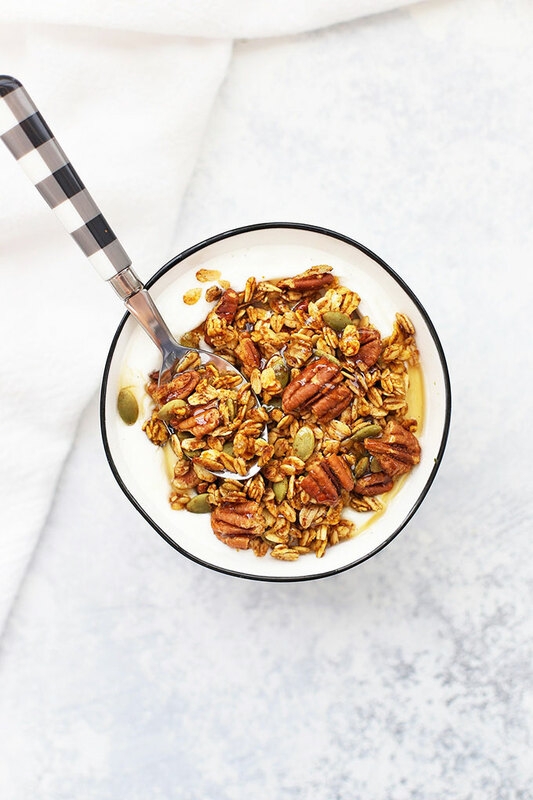 In a large bowl, toss oats, pecans, and pumpkin seeds. In a small bowl, whisk together pumpkin, maple syrup, coconut oil, cinnamon, vanilla, and salt. Toss oat mixture with the pumpkin mixture until well coated. Spread granola out onto a parchment or silpat-lined baking sheet. Bake at 350 degrees for 20-30 minutes, or until golden. Stir every 8-10 minutes for even browning. Allow to cool completely before storing in an airtight container. Granola will keep about 1 week. Recipe & post updated October 2018. Originally posted December 2013. The man I live with (and love!) doesn’t believe there can be such a thing as ‘too much pumpkin’ in the world. He will love this! I will need to buy some pepitas and then this is on the menu, Yum! I am excited to try this! The banana bread version is so yummy…like, I can’t stop munching on it yummy! Ok – I’m officially sold. I need to make this ASAP. Maple pumpkin granola? Yes, yes a thousand times yes. I was lloking for a topping for my Greek yogurt breakfasts! This sounds amazing! Can hardly wait to try it! This looks delicious and I love pumpkin. Speaking of pumpkin, I made your pumpkin/chocolate chip muffins a couple of weeks ago. And I bought the silicone muffin pan you wrote about, which was so neat. The muffins popped right out. But although the tops were done (and the muffins were cooked all the way through), the sides of the muffins looked kind of spongy and not browned and crisp at all. Again, totally cooked, but a weird texture. This does not happen when I use my aluminum pans. Do you have this experience. They tasted great, but they did not look like a normal muffin on the sides. Thanks. Teresa – Hmm… that hasn’t happened to me before! The tops and bottoms of my muffins (all different recipes) are almost always always slightly darker than the sides (whether I use an aluminum, ceramic, or silicone muffin pan), but I’ve never had them be a weird texture before. I’m wondering–what type of flour did you use? Sometimes different flour blends behave differently.